The University is within hailing distance of the finish line in its $1.6 billion fundraising campaign. Next fiscal year will represent a mix of constraint and opportunity as Emory achieves significant milestones while grappling with external limits in federal funding and health care reimbursements, even as demands for financial aid continue to rise, top administrators say. Early decision applications for the fall 2012 class in Emory Coillege of Arts and Sciences are up markedly over last year, rising 18 percent for Early Decision 1 and 21 percent for Early Decision 2, suggesting that seats in Emory's four-year undergraduate division are more highly coveted than ever. Sponsored research awards for Emory investigators are the highest in history, reaching nearly $540 million for FY 2011. "By these and other measures, Emory is enjoying unprecedented success," says Earl Lewis, executive vice president for academic affairs and provost. "At the same time, we must acknowledge that the worldwide economic readjustment that began with the collapse of equity markets in 2008 is proving to have enduring consequences for us and other research universities. "The 'new normal' is not so new anymore," he continues, "but we are still trying to get accustomed to it. On the one hand, we are working hard to capitalize on new opportunities, including initiatives launched within the schools as well as in the central university. On the other, we have to acknowledge that although the stock market has rallied significantly from its plunge three years ago, extremely high levels of unemployment and other forms of economic weakness are persisting and continuing to affect American families in a profound way. For a combination of reasons, higher education generally is in a place we did not expect to find ourselves only a few years ago." • Trying to offset declines in health care reimbursements. Mandl says that Emory adjusted well to the immediate effects of the 2008-2009 economic collapse, wringing an estimated $40 million in spending out of budgets, in part through reductions in force in administrative areas. Three years later, however, while the immediate effects of the financial crisis have been addressed, longer-term external conditions, including societal and technological change and structural economic challenges, have intensified, and national and global economic uncertainty persists. The same factors are weighing on virtually every private as well as public institution. 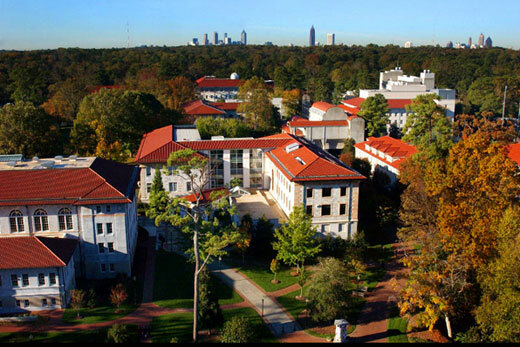 Ongoing news coverage of higher education shows that many research universities continue to grapple with the deep deficits and needs for cuts that Emory met head-on in 2008 and 2009. At Emory, budget letters sent from the Ways & Means Committee to schools and major operating units have disclosed that four of Emory's nine schools plan to draw from reserves or unrestricted funds to meet operating losses in the current year. As the University looks forward to FY 2013, challenges will be especially acute in Emory College of Arts and Sciences, where undergraduate financial aid requirements continue to grow, and the School of Medicine, which is vulnerable to changes in federal research funding and health care reimbursements levels, among other factors, Mandl says. S. Wright Caughman, executive vice president for health affairs and also a member of Ways & Means, says pressures on academic medicine in the coming year will be felt from virtually every side. Emory Healthcare's recent formation of a joint operating company with Saint Joseph's Health System is one response to a rapidly consolidating Atlanta marketplace. At the same time, both Emory Healthcare and the School of Medicine are sensitive to changes in the funding of Medicare, Medicaid and research support from the federal government and elsewhere, he says. "Emory Healthcare must increase both its liquidity and investments in facilities renewal at the same time the School of Medicine continues to require clinical revenue support for the research and education mission, and the outlook for clinical revenue growth remains low," he says. "Fortunately we have wise oversight in the Board of Trustees and excellent management in both the School and health system. But there is no ignoring the fact that many of the premises that underpin the financing of health care delivery, teaching and research are up for reexamination in the current political and budgetary climate, with the future of health care reform itself still unsettled." President James Wagner says the years ahead can be Emory's best if the University is bold enough to seize the opportunities that present themselves. "Emory's financial base is strong, and our leadership at all levels is working together to meet these challenges," he says. "Emory will invest in its priorities and focus on what is excellent and what is essential. We must position ourselves to take advantage of technology, globalization and changing demographics, believing as we do that society will continue to need special institutions like Emory that combine research intensity with rigorous education at the undergraduate and graduate levels." Ways & Means is meeting with deans, directors and vice presidents through the end of January to consider their FY 13 budget requests and submissions. A balanced budget will be presented to the Board of Trustees as is the case every year.